OBC Recruitment 2017 – 120 Specialist Officer Posts :- Oriental Bank of Commerce (OBC) has released notification for filling up 120 posts of Specialist Officer. Desirous & eligible candidates can apply online from 07/04/2017 to 26/04/2017. For Post No. 01 to 03 : Chartered Accountant, Taxation): Passed the respective CA Exam in 1st attempt from “The Institute of Chartered Accountants of India”. For Post No. 04 : Full time MBA in Finance/Full time PGDBM of 02 years with specialisation in Finance/ Qualified Chartered Accountant/ICWA/CFA from a recognised university/institutes recognised by the central government. Refer to notification for more details. Starting Date of Online Application :07/04/2017. Last Date of Online Application : 26/04/2017. Application Procedure : Eligible candidates can apply online through website http://www.obcindia.co.in from 07/04/2017 to 26/04/2017. 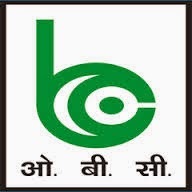 Oriental Bank of Commerce (OBC) has issued latest recruitment notification for filling up 14 post of Faculty, Office Assistant & Attender on contractual basic for RSETIs Centers. Desirous & eligible candidates can apply in prescribed application format on or before 20/12/2016. Age Limit as on 30/11/2016. 01. Faculty : Post Graduation Degree in MA/M.Com/M.Sc./Master of Social Works, Psychology, Sociology etc. 02. Office Assistant : Degree in B.Com/BA/B.Sc etc. Application Procedure: Eligible Candidates can send their application in the prescribed format along with all relevant documents to relevant RSETIs Centers on or before 20/12/2016. Oriental Bank of Commerce (OBC) has released recruitment notification for filling up 117 posts of Specialist Officer. Desirous & eligible candidates can apply online from 29/04/2016 to 13/05/2016. Age Limit: Maximum age is 35 years. 01. Senior Manager (Risk Management): Graduate in any stream full time regular course with aggregate 60% marks or equivalent in CGPA AND Post Graduation full time regular course in Mathematics/Statistics/Economics or MBA in Finance /Banking/Risk Management or PG Diploma in Finance/Banking/Risk Management) or Engineering with aggregate 60% marks or equivalent in CGPA. 02. Manager (IT): Engineering Degree in Computer Science/Information Technology/Electronics & Telecommunications/Electronics & Communication. 03. Manager (Forex): Graduate/Post Graduate preferably with Commerce/Mathematics/Economics background. Last Date of Online Application : 13/05/2016. Application Procedure : Eligible candidates can apply online through website http://www.obcindia.co.in from 29/04/2016 to 13/05/2016. Subscribe our free job alert mail for OBC Recruitment 2017.